0. Preheat oven to 350 ºF. 1. In a large bowl , mix your almond flour, cocoa powder, baking soda, and pinch of salt together. 2. If your butter is still in its solid state, throw it in a smaller bowl and heat it up in the microwave for a few seconds. 3. Mix your liquid ingredients together: Eggs, melted butter, honey, and vanilla extract. 4. Pour this liquid mixture into previous dry mixture, and mix it all together well. You can use a hand mixer like I did to speed things up! 5. 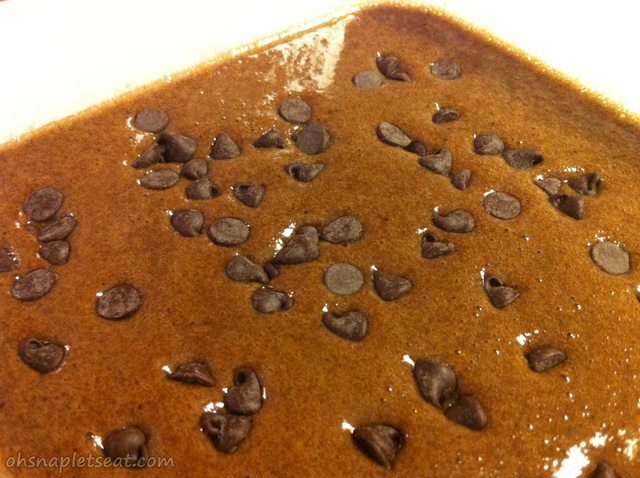 (Optional) If you want to have chocolate chips, you can add it to this mix too. I couldn’t make up my mind on the chocolate chips so I added it at the very end after I had already put the brownie mix in the pan. 6. Now grab a 8×8 baking dish , and pour the brownie mixture in it. 6. Bake this for about 30-40 minutes. It kind of depends on your oven how long exactly, but a good way to check is to poke it with a toothpick. If the toothpick comes out clean (it’s okay if there’s a few crumbs) then you’re good. 7. Let it completely cool down before cutting it in to your desirable brownie sizes. And then you get ready to shove your face! **Edit 7/20/13: So sorry, every one! Apparently, I was super dumb and forgot to include honey on the list of ingredients! 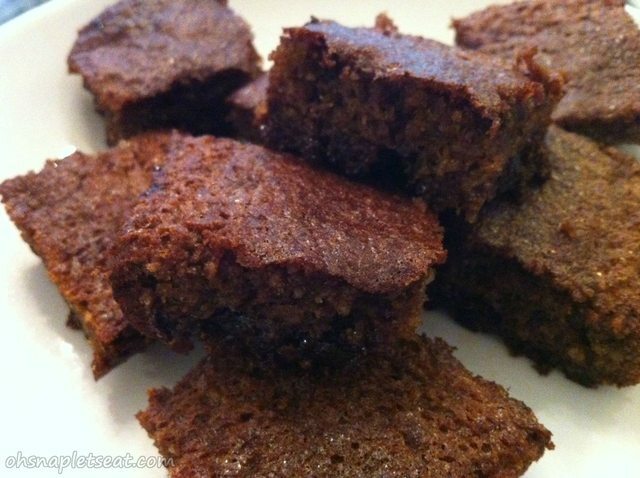 Please do add honey so that your brownies are sweet (unless you don’t want to, I can’t tell you want to do). In a large bowl, mix your almond flour, cocoa powder, baking soda, and pinch of salt together. If your butter is still in its solid state, throw it in a smaller bowl and heat it up in the microwave for a few seconds. Mix your liquid ingredients together: Eggs, melted butter, honey, and vanilla extract. Pour this liquid mixture into previous dry mixture, and mix it all together well. You can use a hand mixer like I did to speed things up! (Optional) If you want to have chocolate chips, you can add it to this mix too. I couldn’t make up my mind on the chocolate chips so I added it at the very end after I had already put the brownie mix in the pan. Now grab a 8×8 baking dish, and pour the brownie mixture in it. Bake this for about 30-40 minutes. It kind of depends on your oven how long exactly, but a good way to check is to poke it with a toothpick. If the toothpick comes out clean (it’s okay if there’s a few crumbs) then you’re good. Let it completely cool down before cutting it in to your desirable brownie sizes. And then you get ready to shove your face! Are you thinking “Ain’t no body got time for that?” Try making a chocolate cake in a cup in less than 5 minutes with my 5 Minute Dessert: Paleo Chocolate Cake In A Cup Recipe! Paleo Valentine's Day Chocolate Treats! 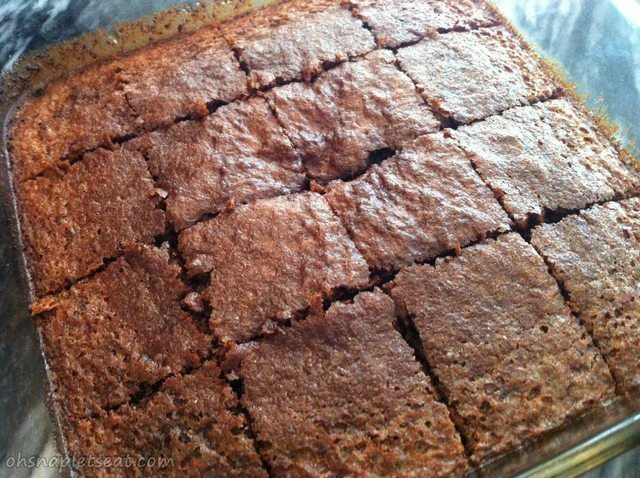 I love brownies and these look really good!. Just to make them a little more special, we mixed 2TBS of lemon zest, 1/3 cup raw honey and 1/3 cup of coconut oil together as a glaze and dribbled it over the top. Great brownies! What an awesome idea! I’ll have to try that next time! I made these and while they are good, they taste more like nutty bread. But I’ve made them twice now, so I really do like them. Gives me my bread fix! I made these today and they were great! I did make a few changes though – I put in 5 tbsps of cocoa, substituted coconut oil for butter, added 3 drops of liquid stevia, and a handful of instant coffee granules…..delicious!!!! Made these today and they are delicious!! More importantly, my 4yo daughter LOVED them. I’m trying to wean her off gluten (she would eat ONLY crackers and bread if I let her) to see whether she’ll be more open to other foods. And now–looking at the comments–I have ideas for customizing them. We got a little carried away but loved the result: We used a full stick of butter, 4 T of cocoa, 1/2 cup almond and 1/2 cup coconut flours, 1/3 cup of agave instead of honey, 1/2 cup unsweetened applesauce, (all of our attempts lately have been really dry, so I did double the butter AND add applesauce) and then 1/2 cup of choc chips & 1/2 cup of peanut butter cups. They were BRILLIANT. Finally a brownie everyone in the family loved AND can eat!! Thank you for the guidelines! Next time I’m going to take suggestions of coconut oil instead of butter, and 5 T cocoa instead of just 4… just to see what happens. Can i use coconut flour instead of almond meal?? how much will i have to use?? These are great! I’ve made them twice. Does anyone have calorie count? I make them in my muffin top pan. Makes 10. I made them yesterday for my tabletop group, which is non-paleo except for me. Instead of chocolate chips I put some walnuts, hazelnuts and almonds in them and my group just loved them! The texture’s so fluffy and they’re not so sweet. Great for snacking while playing! 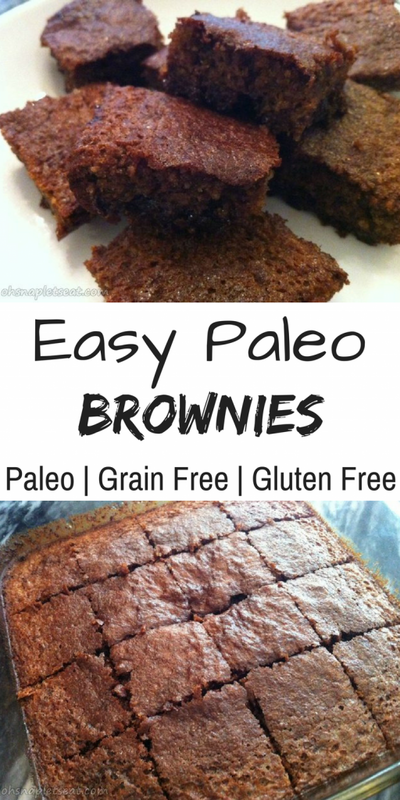 Did anyone realize these aren’t Paleo Brownies because they have butter? Just wondering. Hi Jess! Lots of paleo eaters are actually include butter in their diet because they are a pretty great alternative to some other cooking oils/fats. (If you’re interested in this: http://paleoleap.com/the-many-virtues-of-butter/ ) But if you yourself don’t do butter, no problem! You can substitute it with coconut oil instead. Thanks! Yes!! I chose paleo recipes for my dairy allergy daughter. Went with the recommendation to increase cocoa powder to 5 tbsp and added in about a half cup of chocolate chips. Delicious!! I made paleo cookies in the past and wasnt a fan, so I was really just taking a chance with these, and I’m so glad I did! Thanks for the easy and scrumptious recipe. Hi Tina from a fellow Atlanta gal! Thanks for the recipe as my husband and I love cakey brownies. This was my first time making a paleo brownie. 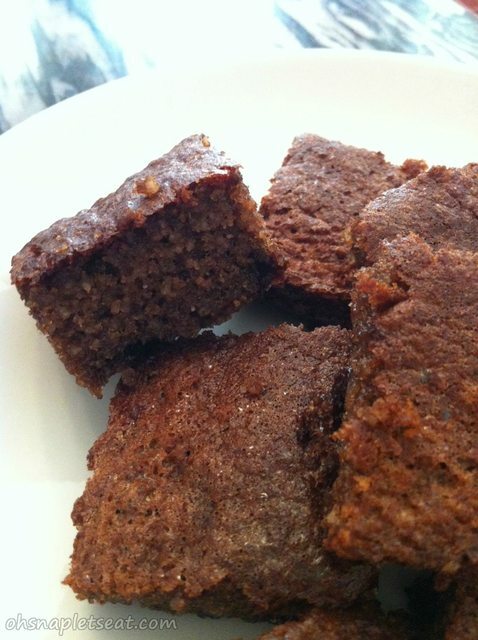 My husband has a really bad sweet tooth so I’m always on the look out for a healthier version of my regular brownies. I would definitely use more honey next time and maybe add one more tbsp of cocoa powder like others suggested. I served it with ice cream so it was ok that it wasn’t that sweet. Hi! Can I use Stevia instead of honey to make these diabetic friendly? If so, how much would you recommend? Hi! Can I substitue stevia for honey to make these diabetic friendly? Tina, I tried the recipe for the second time and added one extra tbsp of cocoa powder and honey then added 1/4 c of chocolate chips…DELISH!!! It’s even better the next day. BTW, I use only Callebaut cocoa powder and chips…this makes a huge difference compare to other brands I have tried. I got the idea from the Barefoot Contessa. Thanks for the awesome recipe! Definitely a keeper! All of my guests loved it! I made them and they were to runny so we had to put in coconut flour! Hello from Brazil! I am really glad I`ve found this recipe! Many of the recipes include coconut flour and I am not a big fan. Just made my first brownies using your ideas and it turned out beautiful and delicious! :) Have a beautiful weekend. I loved the slightly crisp top and moist center! I am watching my sweets intake for candida so I subbed 1/3 c. coconut milk and stevia extract for the honey. Works great! Topped with unsweetened shredded coconut and pecan pieces! Yum, thanks for an easy recipe!